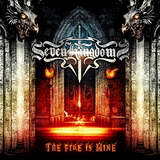 When the promo copy of Seven Kingdoms The Fire is Mine landed in my player something deep in recesses of my memory received a stir. I thought I have heard this name before … Florida based, straightforward heavy/power metal, good looking blond female singer – I could swear I have seen it or heard it somewhere, yet my collection did not have the mention of Seven Kingdoms in it. And then it hit me, I saw this band on the live tour once, when they played in support of Blind Guardian. I am sure their fans would correct me if I am wrong here. Nothing jumped at me during that Seven Kingdoms set, and I could not label that performance by the band as a standout, although it is rather unfair to form the first opinion in the live encounter, when everything is geared towards the more famous headliner, including the stage, the sound, etc. In this light The Fire is Mine is my first proper introduction to Seven Kingdoms, and while the needle of competency has been significantly upped by this album, the main question of what sets Seven Kingdoms apart from its peers remains unanswered. The album, track after track, runs through a number of rather raucously and coarsely sounding power metal, in the style of Iced Earth and Blind Guardian, without the pomp and epic feel. Given the clean female vocals by Sabrina Valentine the other notable comparison I could make was dismantled Swedish outfit Amaran, but Sabrina Valentine is no Johanna DePierre. Sabrina vocals left me impacted in the higher end of the register, but she lacks power when the proceedings shift a little lower. Punchy production and all, courtesy of Jim Morris, Seven Kingdoms play very competent, double bass fueled and pleasant to listen to power metal, which could stand a bit more of everything in every department to push it over the top. More memorable hooks in choruses, more unusual riffing patterns (In The Twisted Twilight), more differing styles and tempos are needed. The songs on the album are all solid, but at some point becoming repetitive, links in the contiguous chain (After the Fall, Forever Brave and Links of Olympus), one following right after another. The half-way acoustic Kardia is the only break in the action, inserted for almost obligatory balladic purposes (it is a cool way for Sabrina to reach out nonetheless). Given more years to refine their art and excellent production quality, Seven Kingdoms look a lot more developed and competent than what I remember from that encounter a few years ago. Their guitarists’ playing are particular highlights as these dudes (Kevin Byrd and Camden Cruz) are superskilled and they love to lean and rage in their solos with some fast-fingered arpeggios (After the Fall). The bass playing receives a boost in spots (Fragile Minds Collapse), and drumming, although mostly asked to provide a backbone, goes out with a number of fills and vignettes. Seven Kingdoms shows that a Maiden gallop is not foreign for them (Symphony of Stars) and they close out with an epic multipart tune with interesting arrangements, The King in the North, taking the page out of older Blind Guardian. Yet their best moments for me come when they do resemble Amaran the most (in so appropriately chosen title track, for example), when the rifflines get stiff and tight, hammering the points home and letting Sabrina weather the storm around her. In real life I am in the business when having a quality product similar to your competitor’s is definitely not a shame, and finding the group of people who would trust you with a purchase becomes key. Thus, it is really not mandatory in my mind to have a new and revolutionary material every time. But the question posed at the top of this review – what makes Seven Kingdoms stand out – remains unanswered, despite the obvious quality of The Fire Is Mine.